When I was little- we had tricycles with a big wheel in the front with a direct drive pedal system (no chain)- and we sat up above it, with two little wheels in the back. The frame was metal, the wheels were rubber. About fourth grade- a new kind of tricycle came out. It was low slung, loud, and looked like a lot of fun- but it had a new name- “Big Wheel.” It looked a lot cooler than the tricycle of old. It was made of plastic- everything. The hollow wheel made a racket no matter what it went over. 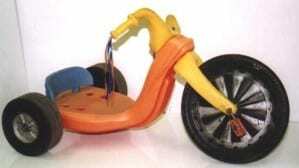 Mattel had a huge hit on its hands- and the old fashioned tricycle was toast. When it came to style- the one on the right- even though it wouldn’t last as long, won hands down. We don’t always make rational decisions when making purchases, but that’s nothing new. As many of you know- I ride a scooter- a 1985 Yamaha Riva 125cc. It’s great dependable transportation that also happens to be a lot of fun to ride. It has a modern body style- with slab angles instead of the graceful curved streamlined classic Vespa look- and that’s ok with me. I don’t see me on the scooter- I just see the world go by. I also own a 1996 BMW R1100RS sport touring motorcycle- it’s an amazing machine, with its boxer engine and ABS brakes. But- when it comes to getting around in the city- I’ll ride a scooter any day. 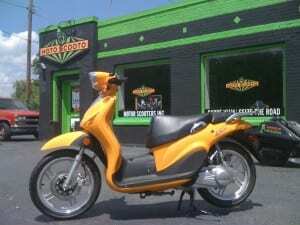 When it comes to where to buy a scooter in Dayton- the pickings were pretty slim until my friend Jason Liff opened up Motoscooto at 1400 Wayne Ave. He took an old service station- that was under option as part of the fateful Wayne Avenue Kroger deal- and made it into an eye catcher with a black and green color scheme that can’t be ignored. My firm designed the logo- the banner- the peripherals- for full disclosure. Of course, the Dayton Daily News and the Dayton Business Journal both ignored this scrappy start-up business. When Jason first started looking into selling scooters- gas was pushing $4 a gallon and killing our economy. Scooter sales peaked in 2008- and now, with gas hovering close to $3 a gallon and credit being tight- scooter sales are down nationally. He’s having a rough time- and it’s not for lack of deals- he’s got a great selection of scoots at bargain basement prices. Now- what does this have to do with big wheels? Up until last week- I’d never ridden a scooter with anything bigger than a 10″ wheel- and I thought that the ultimate scooter- was a Genuine Buddy 150 cc. For the price- it was built well and it looked great- and was from a well known brand name. Last week- everything changed. I got to ride a CF Moto 150 cc big wheel scooter. It’s as if I got the “Big Wheel” I always wished Mattel had made- one with real rubber wheels- and a chain drive (I guess I saw recumbent bikes coming at an early age). Riding through the washboard cobble stones of the Oregon District wasn’t a 5 mph bone shaker anymore. And- real counter-steering cornering was possible. CFMoto makes the scooter in two varieties- the Jewel- which usually retails for around $2,500– which Jason is selling for $1,300 right now- and a fuel-injected version, the CF Glory that’s supposed to cost around $2,700 and you can steal for $1,700. 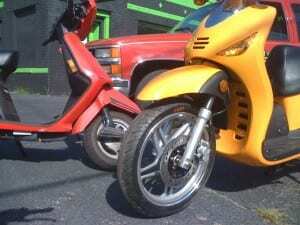 Either way- you still get 90 mpg and a scoot that hauls you around in comfort. The upgrade to the CF Glory gets you an electronic dashboard too- big whoop, but the fuel injection makes this scooter a speed demon. Taking it out today for a spin, I got the usual “Can it do a wheelie?” question- and I almost thought that I could on the Glory. I realize scooters aren’t for everyone- but, to be able to pick up one of these for $1,300, and consider the savings in gas, parking, and maintenance compared to a car- I think it’s the right thing to share with my readers. If you’ve never ridden a scooter before- it’s really easy- they are all automatics, with no clutch or shifting. It’s why when you go to the islands- there are scooters for rent all over the place. In many parts of the world, scooters far outnumber cars. The State of Ohio has an amazing Motorcycle Safety Foundation course for $25 that will teach you how to be a safer rider- your final assignment is the actual driving test. These prices won’t last long- and, even though people think that you can only ride scooters for 6 months of the year in Dayton- I’ve been riding year round for the last 5 years. As long as there isn’t ice on the roads- scoot away. If you do decide to go down and see Jason- please tell him you read it here on esrati.com and happy scootering. These big wheeled scooters may change your life. Previous Post: Desperation and Morality: where to draw the line? 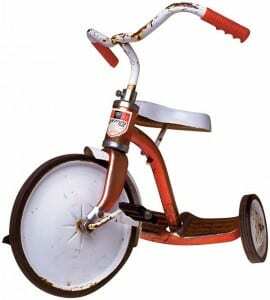 I had a Big Wheel when I was a kid, and who cares that they wouldn’t last as long as a traditional tricycle? Big Wheels could do things traditional tricycles never could do. My friends and I used to ride our Big Wheels way up to the tops of the steep driveways in front of our houses and zip back down into the street (this was in low traffic suburbia) — on traditional tricycles we’d have ended up flat on our butts. And Big Wheels made noise, which made them even more attractive to kids. Clack, clack, clack, clack! So much noise that my mother couldn’t stand it and had my grandfather take the clacker off mine (no, I’m not still bitter). Sure, Big Wheels weren’t made to last — I pedaled mine around until it had a hole in its front big wheel, though even then it was still driveable — but about the time a Big Wheel wears out, its owner is too big for such things. I guess frugal parents could complain that Big Wheels couldn’t be handed down to younger siblings, but those parents are killjoys. Sure, buy a sturdy used tricycle on the cheap at a garage sale and hand it down to your kids, but they won’t have as much fun as the cool kids privileged enough to get brand new Big Wheels! Big Wheels (yeah I know its not a real Big Wheel) always remind me of this little gem. And while Fernardo’s comment is a pure ad for going off and seeing a country on a motorcycle-I”m leaving it up- because, I agree- you see things differently on a scooter or motorcycle or bicycle than you do in a car. And one day- I’d love to take his tour.